Something more casual today. This pencil, the 1.3mm Staedtler 771, has bright Noris colouring. It is a large chunky triangular pencil, and has no trouble surviving and being found after a wind gust. It feels sturdy and solid, and at about $CDN10 ($USD8, 7 Euros), has an unexpected wealth of features – a clip, a retracting cylindrical guide, a rubbery grip area, and a twist-out eraser. Today is a provincial holiday where I live, and some time in the backyard makes me realize that at least in certain circumstances – the visibility of a pencil is an asset. A small sticker tells me the pencil is made in Japan. My only misgiving is that 1.3mm lead is not commonplace here. The Staedtler 771 is made in Japan, and was first presented at Paperworld in January, 2008. The pencil commenced sales in Germany in May, 2008. 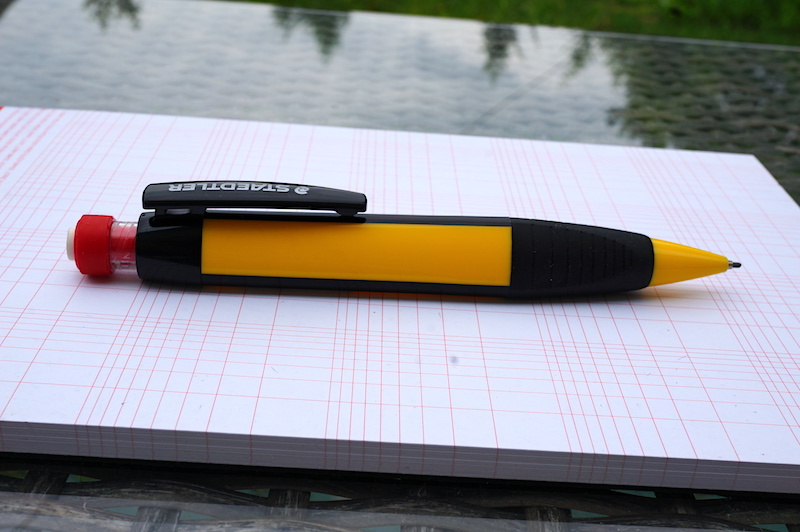 Early 2014 saw the pencil’s discontinuation in Germany. In Japan, the 771 continued, and was joined in Fall 2014 by a white and black version, the 771-0. Both versions continue to be offered in Japan. Gunther mentions that “Staedtler Germany still offers 1.3 mm leads because they were also used for the graphite 760.” The 760 was discontinued, though the 925 appears to still be around. Tell me more about that pad of paper with the amazing grid on it! Andy, that is a Grids & Guides logarithmic notepad that I bought at Books Inc. on Castro St. in Mountain View, CA. Not adverse! Thank you, I will look. I have not previously heard of a 1.3mm multi-pencil! Hi, How do I get in touch with you to review a mechanical pencil I made and possibly guest writing for my blog? Great work!